The main toolbar provides access to operations with test scenarios and their individual lines. All the buttons have a corresponding keyboard shortcut for quicker access. Check the keyboard shortcuts by pressing . (full stop). New test - creates a new test in the specified folder. Save test - saves the test. Clean test - cleans up the results of the previous test execution. Import - imports the JSON test definition. Undo (Redo) - reverts (replays the reverted) edit operations. 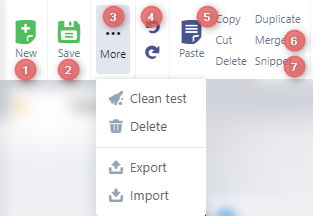 Paste, Copy, Cut, Delete, Duplicate - perform the standard editing operations on the selected test lines. Merge - merge compatible lines into one. Create snippet - creates a new snippet from selected lines and replaces the lines with a reference to that snippet. Please note, that currently the references to view elements are exported as is, meaning that elements referenced in the test are expected to exist (in element repository) before the definition will be imported again. All test operations available for the currently selected configuration are presented on the main toolbar. Pressing a button will create a line template for that particular test operation that can be further customized. Assert - inserts an assertion line. Press button - inserts a button press line. Poll URL - inserts a poll URL line. Wait until - inserts a delayed assertion line. Snippet inserts a reference to a test snippet. Sleep - inserts a sleep line. 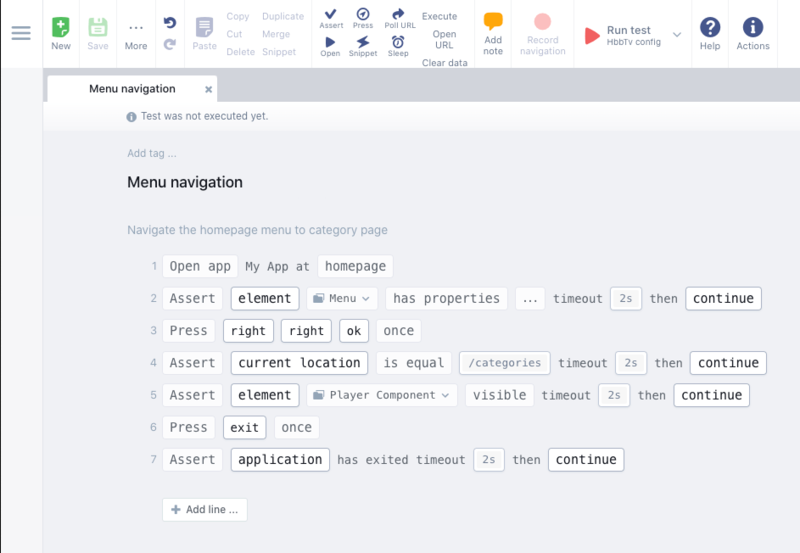 Open - inserts an open app line. Execute - inserts an execute command (Only HTML-based platforms) line. Click on - inserts a click on line. Send text - inserts a send text line. Move to - inserts the Move to line. Set text - inserts a set text line. Browser command - inserts a line that sends a command to browser. The currently active test can be executed on a connected device directly from the Test Editor. Editor can also record the interaction with the app and such recording can be used as a basis for a test. Add note - adds a note line, allowing to write comments into tests. Record Navigation - switch recording on or off. Schedule on devices - opens Test packs defined for this application. Run test - runs test interactively on a connected device. Run test with preview - runs test interactively with a preview turned on. Other drop-down items are configurations created for the current app. Help - opens documentation pages. 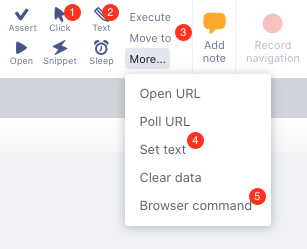 Actions - opens a window with all the actions available in test editor and their shortcuts. A test recording may become littered with many press button lines. You can combine similar press button lines by using the Merge lines operation on the main toolbar. You can also create lines with multiple presses without merging existing lines. Using the virtual remote control (VRC) you can control devices right within Suitest. Connect to a device, then press on the small VRC toggle on the right hand side to bring up the VRC. The Test editor has an integrated device console that displays application logs. The Suitest console also allows you to view network requests that are made by the application during test execution. From the log you can easily create assertions on the network requests. Currently the Suitest console is only available for HTML-based and Xbox One Native platforms. Since you should not use the instrumentation library in your production code you should prepare your code accordingly. Once your application is instrumented you can use the Suitest console. If you like to use the Suitest console in more often then it would make sense that you create a logger class and a special method in it that has the wrapper like the example above. Beware that if you send empty messages with null or "" an exception System.ArgumentException will be thrown. TraceSource is optional NuGet package for logging. Our instrumentation library adds the SuitestListener and forwards all the messages to the Suitest console. The message will appear in the Suitest console. If you would like to keep this functionality do not remove the listener.